I have put forth a lot of scriptures to prove scripture teaches we New Testament believers are not the first to have the gospel preached to us. Scripture teaches we are but the latest in a long line of people who have trusted in God’s promises. I have put forth many a scripture to prove, like Abraham, we have a promise of salvation and a promise of eternal life. Scripture teaches we gentiles have been adopted into the covenant and promises of God that were announced to Abraham and the prophets. Speaking of the Law, we know scripture teaches it was a shadow of the good things to come and the reality of our hope in God’s promises are found in Christ. Since God was letting the shadow pass away with the coming of Jesus, in fulfillment of the gospel announced to Abraham, what was God expecting men to do in response to this Holy event? Let’s us be certain in our hearts that we understand scripture teaches that God was fulfilling His covenant with Abraham and what was spoken by the prophets. Isn’t this what I have been defending all along about the gospel that is found in scripture? There was a promise given to Abraham concerning our salvation and spoken of by the prophets. Even more exciting, it was prophesied that John would bring the people a knowledge of salvation through the forgiveness of sins. Just as I have been saying in defense of the gospel. We have the knowledge, the hope of salvation that we will receive our eternal life when Christ returns because of the work of Christ on the cross redeeming man from his sins. Christ has paid for our sins and given us the path of life, but we must walk in it. Did God want mankind to simply acknowledge what He was doing in fulfillment of the promises He had made to His covenant people, just so they could go on their merry way? Would He desire men to simply be spectators? The people were not to be simple spectators, but were expected to respond in kind by going down to the Jordan and being baptized. Was their act a simple ritual of getting baptized as a religious ceremony? No, God wanted a people with a repentant heart to respond to John’s message of repentance and be baptized. They were pleasing to God, for they heeded John’s message of repentance and, they showed a repentant heart by confessing there sins, and then they where baptized. 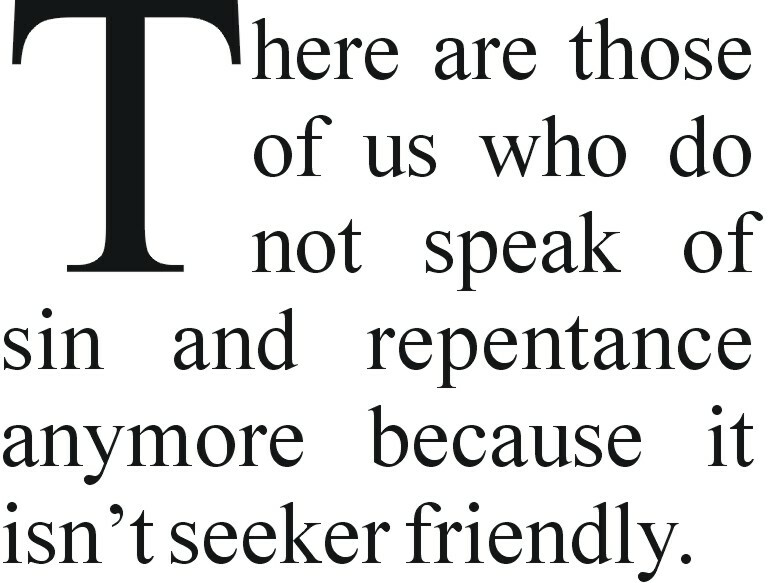 I know this talk of sin and the need to repent doesn’t sound to seeker friendly. There are circles in Christendom that think this message is too abrasive and confrontational for today and that it doesn’t really fit the church any more. WOW! That was definitely not seeker friendly, but this is the message that not only did God choose to announce by the Holy Spirit through John. God saw fit that it was recorded in His word for all to read and to gain understanding from it. Like me, did you notice that the message preached to announce the coming of a new and better covenant in Christ, wasn’t “God loves you”? From the gospel announced to Abraham and the prophets, it appears it wasn’t necessary. It was already preached in the old Covenant of the Law that “God loves you”. Now from many pulpits in America we only want to preach about God’s love for us. Ironically we do not preach God’s love for us from the Old Testament, but mostly from the New Testament were we find the message of repentance not the introduction of God’s stated love for us. But the fulfillment of God’s stated love for us in Christ Jesus as promised to Abraham and even before the beginning of time. As I mentioned before, God didn’t become the God of love in the New Testament. He was alreadythe God of love when scripture records. 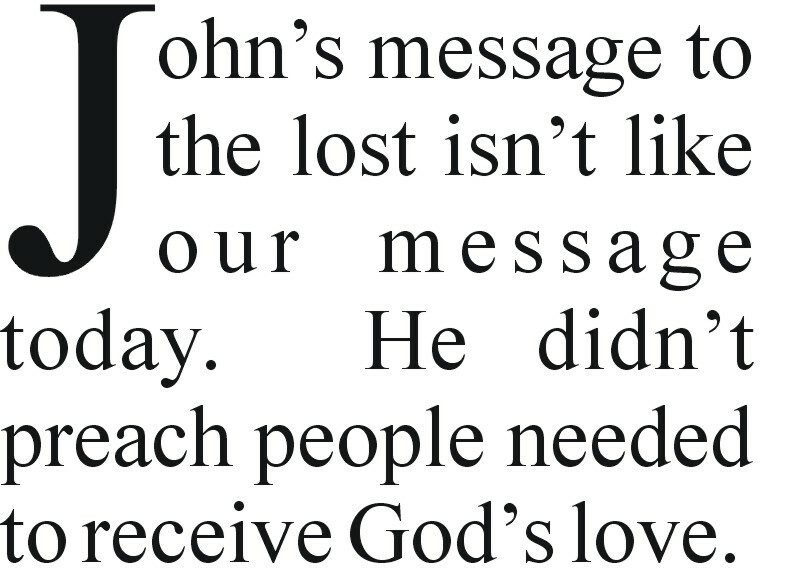 Did you also notice John’s message to the people wasn’t to receive God’s love either, it was to repent? As people of God they knew they received the benefits of God’s Covenant of Love through following His laws. Meaning if they did not live disobedient lives in regards to God’s commands by an irreverent sinful lifestyle, then they had the benefits of the Covenant of Love. I know that from many pulpits in America we only want to teach people to receive the love of God as if this is the gospel message. 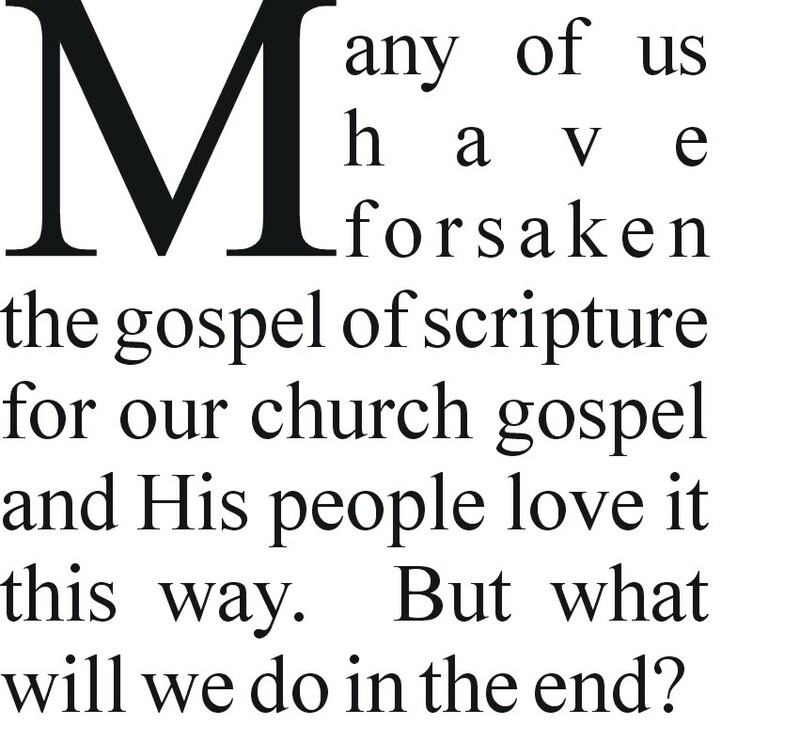 Have we considered maybe our message in the church is not the message of the gospel after all. We preach from and assume the New Testament is God’s revelation of love to His people when it is a fulfillment of a promise made in the covenant at Mt. Sinai. A fulfillment of His Old Testament Covenant of Love. If we continue to insist the New Testament is God’s revelation of His love, then what do we call the scriptures we just read? God already had a covenant of love established with His people in the Old Testament. The New Testament is the fulfillment of His love in Christ. Our expected response is not to know this love. Our expected response is to repent of our disobedience towards God’s Covenant of Love. Those who received the gospel revealed to Abraham, the Law of Moses and the prophets knew that God loved them. They also knew it was their sin that separated them from His love. Again let it be said, they knew it was their sins that kept them from God’s love. How is it today we assume we are kept from enjoying God’s love for us because we don’t know God’s love? When it is our rebellion towards His word and our hardened hearts and stiff necks. If we could just make people aware that God loves them is our anthem cry. 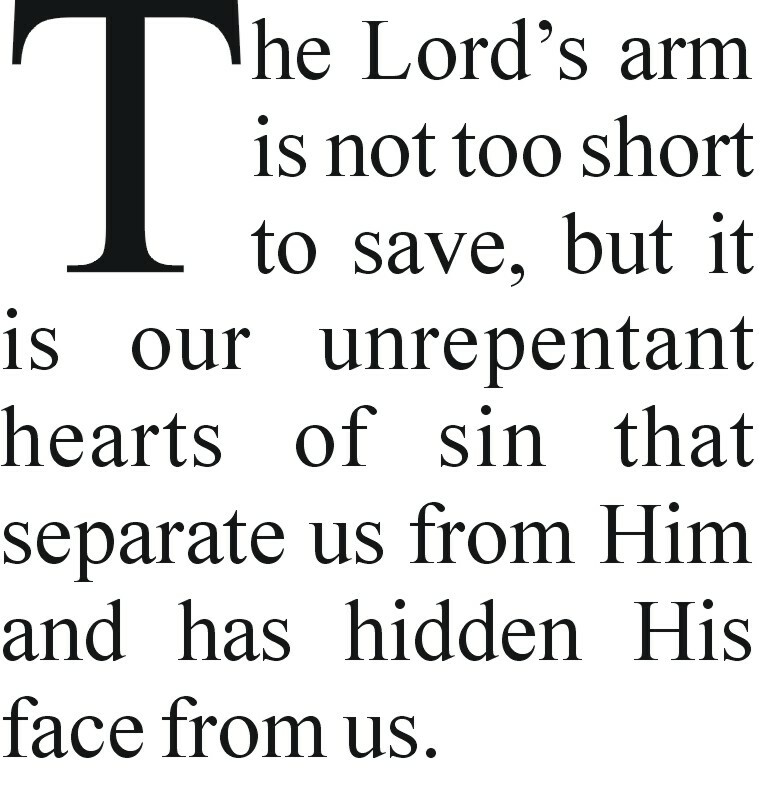 When it is our sins that keep us from God’s love. We preach over and over again from our pulpits to receive God’s love for us. To Accept God’s love for us. Remember the gospel wasn’t announced in the days of days of John by saying accept God’s love. The message was to repent because they left His covenant of love by their disobedience. We in the church by our preaching, teaching and lives say the gospel is Jesus paying for our sins by dying on the cross. This much is true. We also say God will forgive us of our sins. This much is true, He will forgive us of our sins. We in the church say by accepting His love or asking Jesus into our hearts we can have His provision of salvation. At this point we leave the gospel of scripture for a slightly tainted gospel. Scripture teaches we pass from death to life when we repent of not only our past sins but turn from our current sinful lifestyle. Then having done so we need to remain till the end obedient to God’s word and His Covenant of Love. Otherwise we will have believed in vain. Knowing this, when they were in their sins and remembered His Covenant of Love, they repented. The answer for those dying in their sins was not to be found in more prophets speaking on the topic of God’s love. Nor was the answer found in the people saying to God, “We receive you love”. They knew they must obey the commands of God’s love. They must stop sinning and obey God, not spend more time focusing on His love. 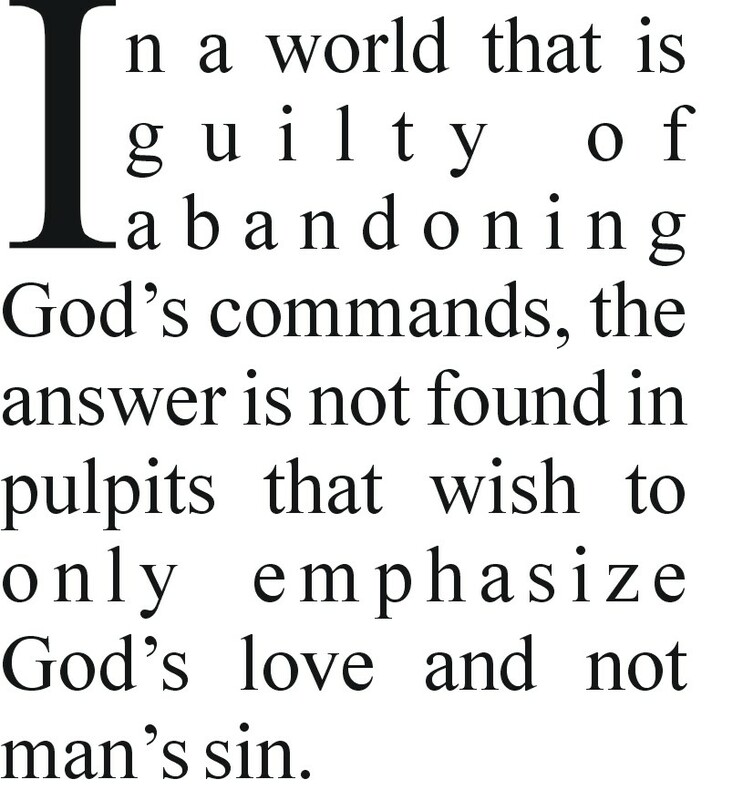 I ask, in a world that is guilty of abandoning God’s commands, is the answer for the lost found in pulpits that wish to only emphasize God’s love and not man’s sin? I ask again, in a world that is guilty of separating its self from God’s Covenant of Love because of its sins, is the answer found in pulpits that wish to emphasize receiving God’s love more than man’s need to repent. It is ridiculous to me, how can a man receive God’s love when the gospel revealed to Abraham and the prophets clearly teaches, we are in God’s Covenant of Love if we obey, but far from God’s Covenant of Love when we disobey? How is it now we want to be in God’s love but not be accountable to obey His word? We in the church do the craziest things. Hey people come enjoy God’s favor, love and forgiveness. I am letting you know about it from the pulpit, so now that you know, bask in it. Come wrap yourself in God’s forgiveness, it is yours if you only believe. Forget repentance it is to old fashion. After all this isn’t my father’s church. I don’t care about being hip, I want to be forgiven. Not only forgiven I want to repent of my sins and leave my life of sin to be obedient. How is that for new twist? I want to be obedient. I felt like I just lost half of you. Let us quit being so foolish by insisting that God only displayed a Covenant of Love in the New Testament. Even if you wanted to argue that in the New Testament Jesus revealed God’s love to mankind. You would still argue yourselves in a corner. The Old Covenant is the very shadow of our Lord. The very fact the Old Testament is Christ revealed in advance to Abraham and the prophets argues you into that corner. How can God reveal His covenant of the promise to His servants, the shadow of Christ, with out His love? He couldn’t and He didn’t. That is why God’s covenant is called the Covenant of Love and this covenant is described as a shadow of the good things to come in Jesus. Let us get back to the message of John the Baptist. The Holy Spirit’s message through him was to call the people to repent. If the people wanted a sermon on God’s love they only needed to go to the synagogue and read the Law of Moses. What they needed now was a sermon on sin and repentance. Let me ask you, do you think it would be a wonderful thing for God to open our minds, so we could truly understand the scriptures, concerning what message we are to preach, whether it be one of love or one of repentance? Would the scriptures teach us to tell the people, God loves them and to receive God’s love? 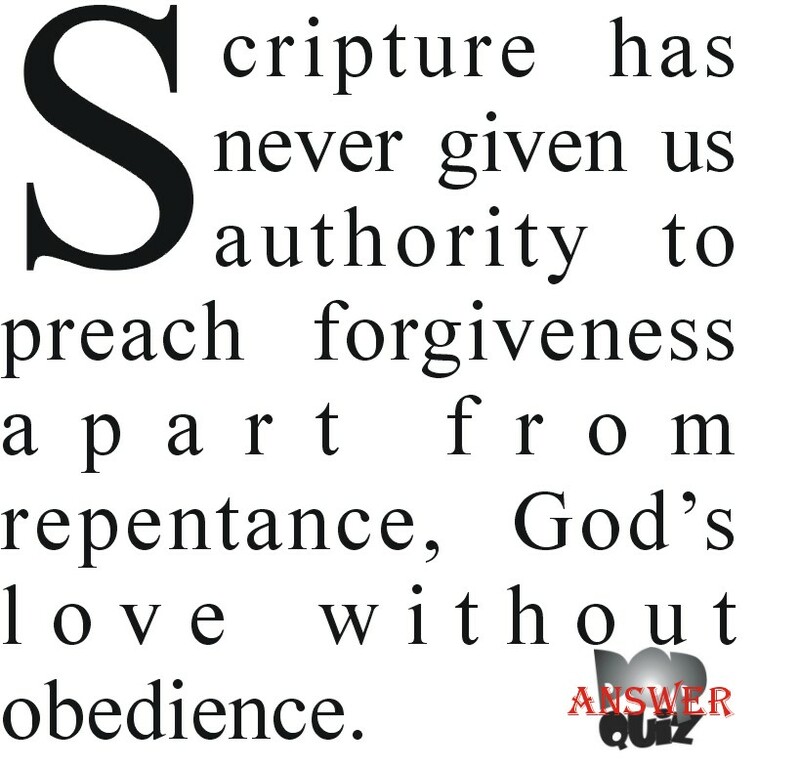 Or would the scriptures teach men to repent and obey God? Jesus did open the mind of those who had the responsibility to share the gospel and He Himself told them what kind of gospel it was they had received and were to preach on. 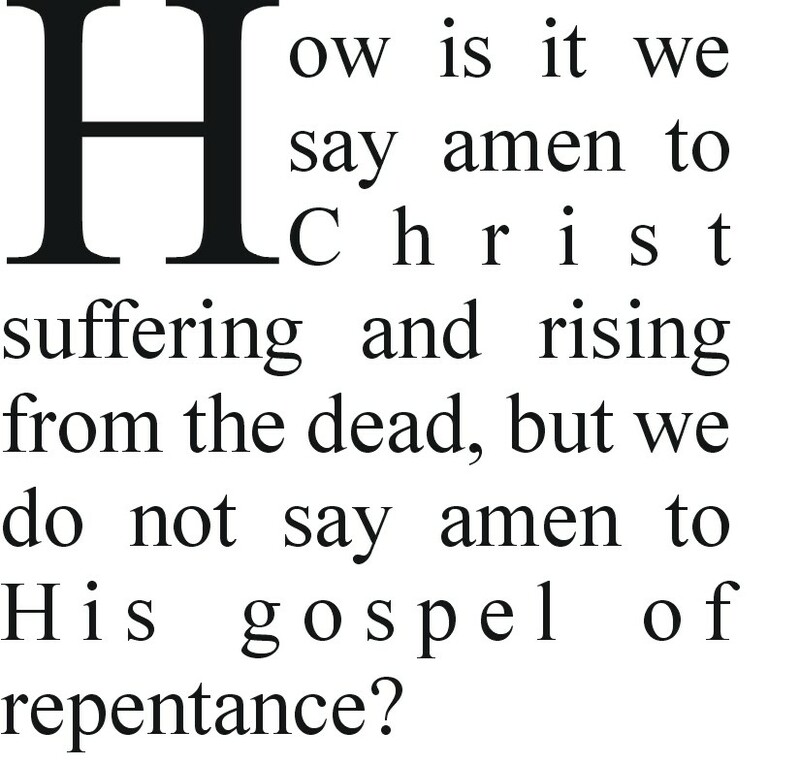 How is it we say amen to the Christ suffering and rising from the dead yet in some circles in Christianity we do not say amen to preaching repentance and the forgiveness of sins? After all it was a command that this should take place in Jerusalem and all nations. What is even more shocking to me, those who preach, know God’s love and receive forgiveness of sin, without repentance message claim to be experts concerning the scriptures. Yet we have scripture recording for us that Jesus opened their minds so they could understand scripture. 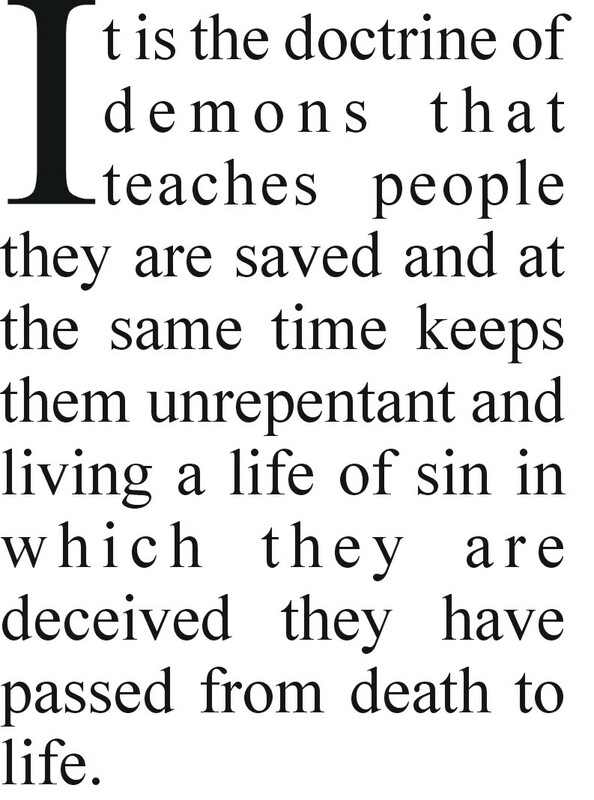 They understood the need to preach repentance. What does your expert preach? What understanding of scripture do they have? Some amongst us are saying quietly so as not to disturb the seeker, psst we don’t mention sin and hell in our gospel message anymore. We speak of God’s love for us and how we can be purposeful people who are driven to do great things in God. We want to bring out the best people can be. We want to help people achieve their potential in business, family and relationships with each other. We instead preach God wants everyone to be forgiven and successful. We for some reason shy away from our part. Repent and obey! Do we now nullify the command of the Lord who saves us to be seeker friendly? So we can preach God’s love and preach how to be successful. As I said before, it doesn’t make sense to me. How is it in Jesus’ name we preach God’s love when Jesus Himself said in His name repentance and forgiveness of sins should be preached? We preach in Jesus’ name God’s love and forgiveness of sins contrary to what we were told to preach. That is if we even mention the word sin. How can we think we can continue to offend the Spirit of grace with our updated gospel without being punished? If God was not going to spare Moses when He stood in the way to kill him because he treated as an unholy thing the covenant, do we think He will spare us. What, do we think we are greater than Moses who saw and spoke with God face to face? Truly I marvel at our stupidity in the church. What did this offend you? Would you rather have me say I marveled at our arrogance in the church? If there are some amongst us who are offended let it be for their correction and salvation. I’d rather be ignorant than arrogant. At least if I am ignorant I still have a hope of correction. But if I am arrogant than what hope do I have for change? What hope do I have to humble myself so I may understand my need to repent? Have we forgotten we are to conduct ourselves in a proper way according to our gospel so we can know we are standing firm? We are not just to stand firm in the gospel we are to stand firm contending for and defending the gospel presented in scripture. Let us reason together on this for a second. If a man could live a perfect life he would not need to repent, but as it is we are all sinners, right? Then we all need to receive the message of our gospel by repenting, then living a life of obedience to God’s word. 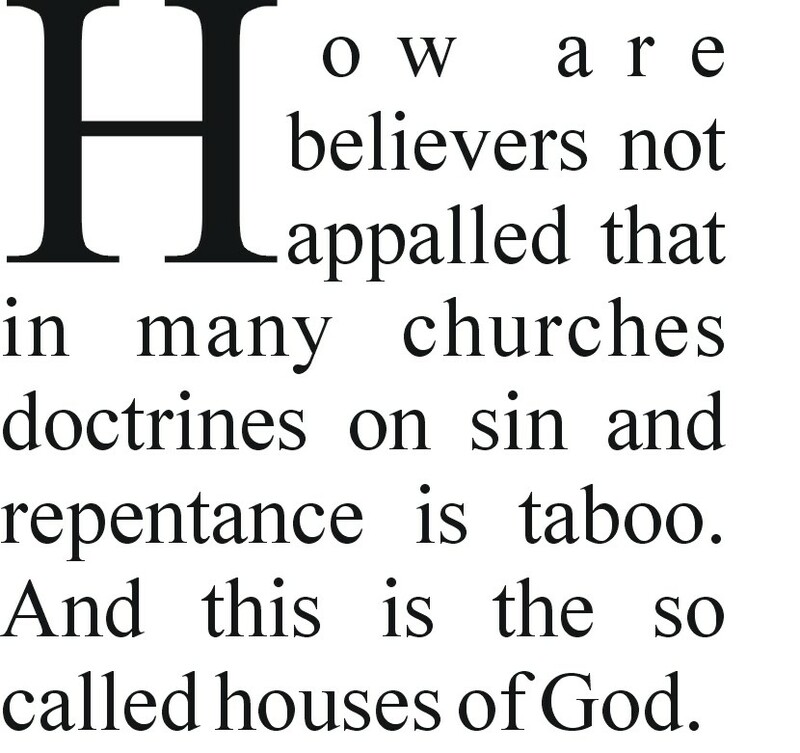 In fact any hearer of the gospel needs to acknowledge their sins and repent. 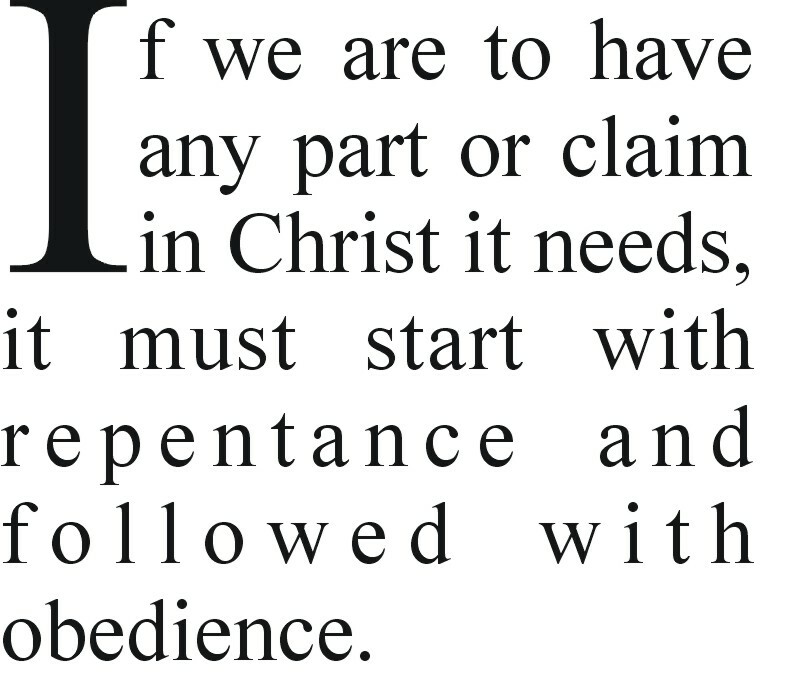 If we are to have any part, any claim or any connection with Jesus it needs, it must start with repentance and be followed up with I will obey. Even Jesus Himself didn’t come to call the sinner to an understanding of God’s love so He could lead the lost into receiving God’s love. He called the sinner to repentance. What are we now greater than Jesus? Is our modern gospel message greater than the one Jesus preached? What did Jesus tell people? Oh yeah I remember, go and sin no more. Jesus made it clear in His teachings that we are to be an obedient people. His message was repentance unto obedience. After all didn’t Jesus “Save Us” from a life of slavery to sin. Isn’t this what we have been saved in while we wait for the day of our salvation? If the testimony of the Old Testament is not enough to convince us the gospel can only be preached if/when we preach repentance. If the testimony of John the Baptist is not enough to convince us preaching salvation without repentance in unscriptural. If even Christ opening the minds of men to understand scripture is not enough, then what is to convince all the saints we have no gospel message without repentance and obedience? What is to convince the saints when we preach a gospel without repentance we give the children of God a false hope? Do we not understand we will be held accountable to the Lord God Himself? Do we have no fear of the Lord? We may not say from the pulpit it is ok to sin, but we do it by default when we don’t preach repentance and obedience to the Living God. We do it by default when we pass out forgiveness and God’s love like candy. We give the people choice meals and delicacies to eat instead of the word of God. We give people a false sense of forgiveness and speak of success, personal achievement and successful family relationships as this is our gospel. Now the body of Christ has just as much divorce, adultery, every kind of perversion, irreverence for parents, shameful speech and things laid before our eyes through entertainment and the internet. Yet we say our gospel doesn’t spread ungodliness through the land. How can this be? How can we say we do not spread ungodliness through the land when we refuse to preach on repentance and holiness? We have reaped what we have sown in the church. We are sick and we know it not. 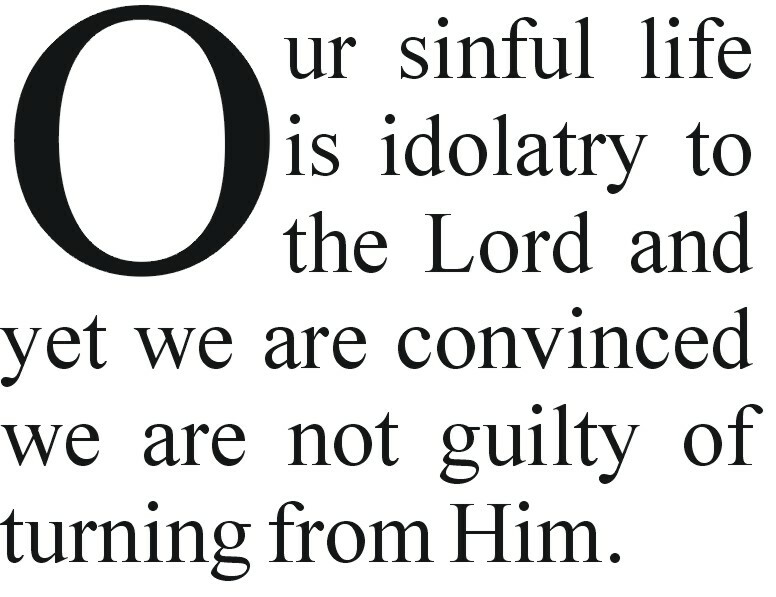 Remember our sinful life is idolatry to the Lord and yet we say we are not guilty? As one more proof we are to repent, what did the disciples preach when Jesus sent them out in groups of two? That’s right, they preached people should repent. They didn’t preach that men need to receive God’s love. The message wasn’t invite Jesus into your heart to be saved it was to repent. I further find it shocking that we have those amongst us who only speak of God’s power or His Holy Spirit and the prophetic movement. But many do it without the context of repentance for sins. They do it in the context of wanting people to know that God loves them. They give their hearers a false sense of security in a false gospel that is not the gospel of scripture. They chase whole heartedly after the manifestation and not after the relationship with God that comes through repentance and obedience to God’s word. Jesus gave the twelve His authority but the message was people should repent. They had real power of the Holy Spirit to heal the sick and drive out demons. Now that is a real manifestation. 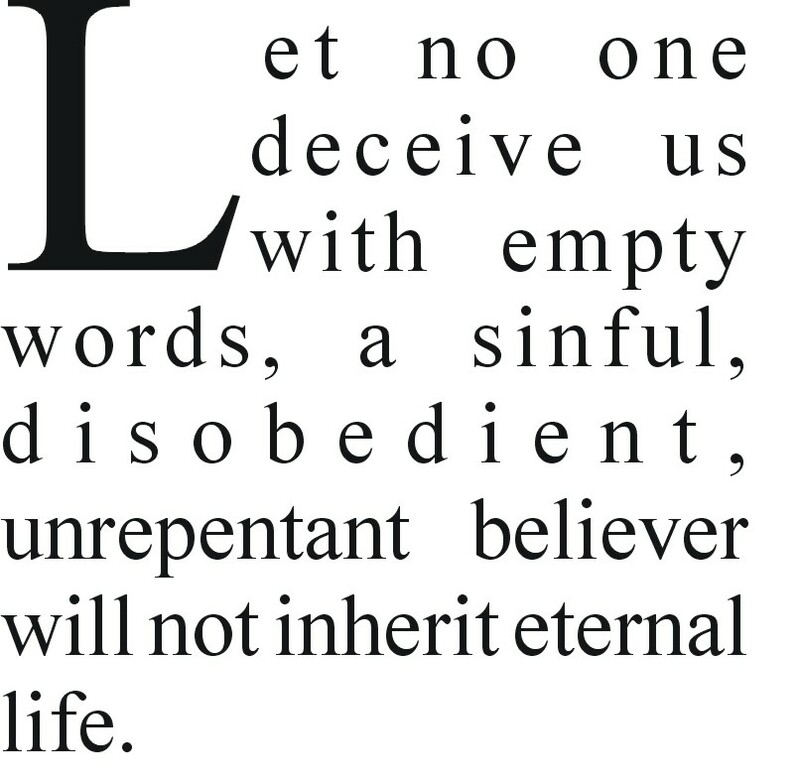 There are those of us who want the power but say nothing of repentance or obedience. We call ourselves believers but I don’t know anybody like this do you? We justify our reality with the comment it was for the early church, although scripture doesn’t teach that. We don’t have it because we have left the gospel of scripture. We know God confirms His word with signs and wonders. How about we preach the gospel according to the gospel and then see God move. To add insult to injury, if the people to whom the disciples preached didn’t receive this message of repentance the disciples were to shake off the dust from their shoes to show the listener they have no part in the gospel. There are those of us who say we represent God with all kinds of self-help and/or moves of the Holy Spirit but without the basis of the gospel according to the gospel, repentance or obedience. What if preachers preach for people to receive God’s forgiveness you ask? I would ask you if the message is forgiveness without repentance. If the message is forgiveness without the sinner repenting, it is just another version of the receive God’s love message. The sinner is separated from God’s love because of sin. They do not receive God’s love by saying, “I receive your love”. Nor by saying, “I receive your forgiveness”. Receiving God’s love or forgiveness without a repentant heart is the teaching of men not God. The so called sinner’s prayer mostly now days is asking God to forgive us. We may even say we are sorry, but that doesn’t mean a changed life. 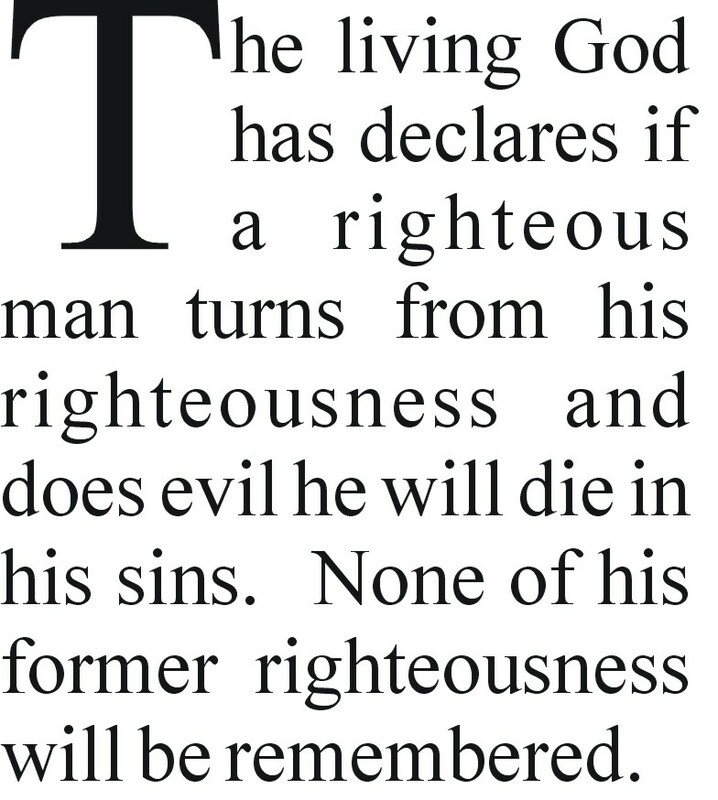 That doesn’t mean a repentant heart or a life “Saved” from lifestyle of sin. How many times do we hear over and over the encouragement to receive God’s love or receive our forgiveness of sin? Just pray this prayer with me so your sins can be forgiven. Since we seem to have authority to preach God’s forgiveness without repentance maybe we have authority to heal too. Can we really say we have authority to teach a man has forgiveness apart from repentance by simply saying I accept your love for me and I accept my forgiveness? So that we may know the church has authority to do this outside of what Christ commanded us to preach in His name, let us heal the crippled, the blind or raise the dead in our churches. Heck if we have all authority to change His gospel surely we have authority to do these things as well. Or do we have no power or authority for neither the healings nor the different gospel. As I have already stated, let us get back to preaching the gospel so God will confirm His word. I have commented that God has already demonstrated His love to mankind in the Old Testament through the promises given to the patriarchs, the Law of Moses and the prophets. Remember His covenant of love to those who obey Him? As already demonstrated, the people of God knew that they left God’s love when they sinned. By repenting it brought them back into that relationship of love with our loving God. Let the body of Christ not make the mistake that this generation only needs to hear of God’s love for them and this is all that is needed. We need more than to come down to the altar and ask Jesus into your heart. We need repentance and obedience in our lives. Now I admit that this country has gone from a nation with knowledge of God to a generation without the knowledge of God. But please let us not talk of the creator’s love without the creation’s response. Let’s not talk about the love of the savior without the sinner’s repentance. Yes God loves us but we need to humble ourselves before the Lord. What is it about our modern church gospel that we preach love and acceptance and not our need as sinners to repent? How is it we only dress the wounds of the people when we preach biblical principles of success in all areas of life from the pulpit instead of the gospel according to the gospel? We have no shame of our sins. How is it we are not shocked and abhorred that sin and repentance is the taboo subject of many churches today? It can only be by arrogance that we will tell the great King of our salvation, we do not need to repent, we just need to recognize His love. We do not need to humble ourselves before Him and die to sin, we just need to invite Jesus into our hearts. If it is not out of arrogance that we preach this church gospel then it is out of grave error that we preach this. Let us humble ourselves before the Lord so we can be crowned with salvation. How is it we nullify the scripture in which we hope when we brag our gospel has no fear of hell, no sin or need of repentance and consequently no obedience required? Our church has a positive message and is contemporary for today’s culture. God has spoken in His word, we need to fear Him and keep His covenant and obey. So let us now go out of our way to show we are not of His flock by telling our converts we have no fear here only God’s love. There is no fire and brimstone preaching here only God’s forgiveness and our success. There is no sin or sinner spoken of here only preaching on being all God has called us to be by preaching our potential . And all of this we say for His kingdom. If we have an unrepentant sinful nature we can not please God. If we have the mind of sinful man we are hostile to God. How at this point can we say to the unrepentant person God forgives you and now you are saved? It’s like putting britches on a pig. It makes no sense. We have read from the Old Testament those who did not obey God’s word removed themselves from God’s covenant of love. Remember the covenant which God declares He will be our God and we His people? They removed themselves from that covenant. Now we in the New Testament have been given the same warning. If we live a sinful disobedient life we cannot please God. Our sinful minds and lives are hostile to God so what do we do? We preach know God’s love to ourselves so we can receive forgiveness for our sins. We don’t preach repent and come back under the covenant and obey. Boy we really take the cake, don’t we? Paul makes it very clear to us. If we are controlled by the sinful nature we do not have the Spirit of Christ. If we do not have His Spirit we can not boast of belonging to Him. So why do we shy away from speaking of sin and our need of repentance in huge portions of the body today? Nor is there talk about living holy as unto the Lord. So our hearers think they can have a life riddled with sin and at the same time have salvation, God’s love and the Spirit. How can this be? According to Paul this cannot be. Not because it is forbidden but because it is impossible! Yet there are huge movements under the Christian banner that have all kinds of manifestations and prophecies without any mention or our need as sinners to repent. Therefore we don’t walk away from our sinful lifestyles to an obedient one before the Lord of our salvation. What, do we really think we can be disobedient because we have Christ while the rest of Biblical history had to be obedient to God? Should we all have the attitude I used to have when I only understood the gospel I received from the generation before me? Should our attitude be, God has to forgive me because Jesus says He has too? I thought Jesus forced God to accept me no matter what because of His blood paying for my sins? This is exactly how I used to think before God reveled to me the gospel according to His word. Although I had read the above passages I did not want to understand them or live by them. I ignored with a gnawing in my soul the passage from Hebrews. We have no greater ground to stand on even in Christ to be disobedient than those of the Old Testament. If we want to live in sin we will die in our sins. Even after we say a nice prayer with the pastor asking God to forgive us for our sins. This is why the gospel came not with the message of knowing God’s love but repentance. If we want to live a life of sin and call ourselves Christians we will be remembered as a people who went to hell even thought we thought we were going to heaven. Have we not heard that Christ is faithful? Yes we have. But have you heard the gospel according to the gospel? He is faithful over God’s house. So yes He is faithful. He is faithful to us if we are part of God’s house. That is if we hold onto the hope we boast in, not the reality of what we do not have. He is faithful to His word if we are not faithful to Him. He will be faithful to punish us. Outside of our being part of His house He has no obligation to be faithful to us. He will be faithful to us only if we remain in our courage and hope. Isn’t this exactly what I have been saying the gospel has been saying all along? We don’t have salvation as a shoe in at the altar. We have to remain hopeful and obedient to the promises of God till the end. But some of us would say He is faithful even when we are not. Right you are. You have spoken correctly but you have not understood. Yes if we are faithless He will remain faithful that is correct. But He is not going to disown Himself, His covenant of love with us or His word to accommodate our sinfulness. He will not disown Himself for our sakes in our rebellion. If we endure we will reign with Him. Imagine reigning with the King of Kings. But if we disown Him He will disown us. If we are faithless He will be faithful to His word. We who are disobedient will go to hell and those who remained faithful to the end will be with Him. Yes He will be faithful to His word. He will do exactly as He has said in His word. Remember what the man of faith whom the Lord entrusted with His inheritance said. He said God was faithful to do the good He said he would for those who obeyed Him. Even more so He will cut off the people as He said He would, who have violated His commands and live disobedient lives. 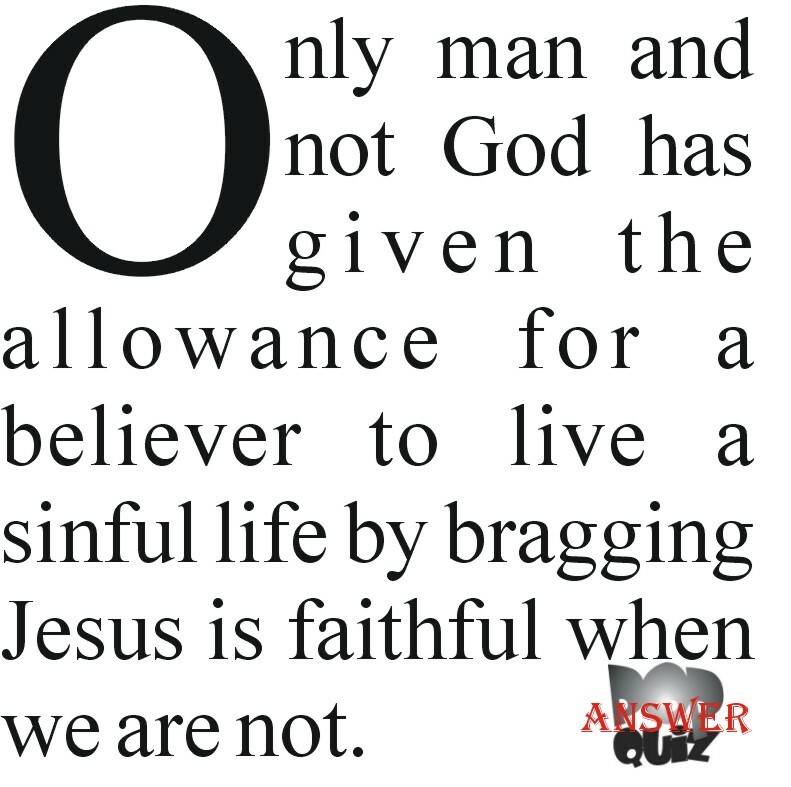 Yes it is true Jesus will remain faithful to His Father for He can not disown Himself. The disobedient believer will die in their sins. Cry out! Lament! How could this be? How could we have such a different gospel in the church today? How can we ever be brought back to the place were we belong. How can we as a people quit straying from our God and His decrees and be put back on the correct path. 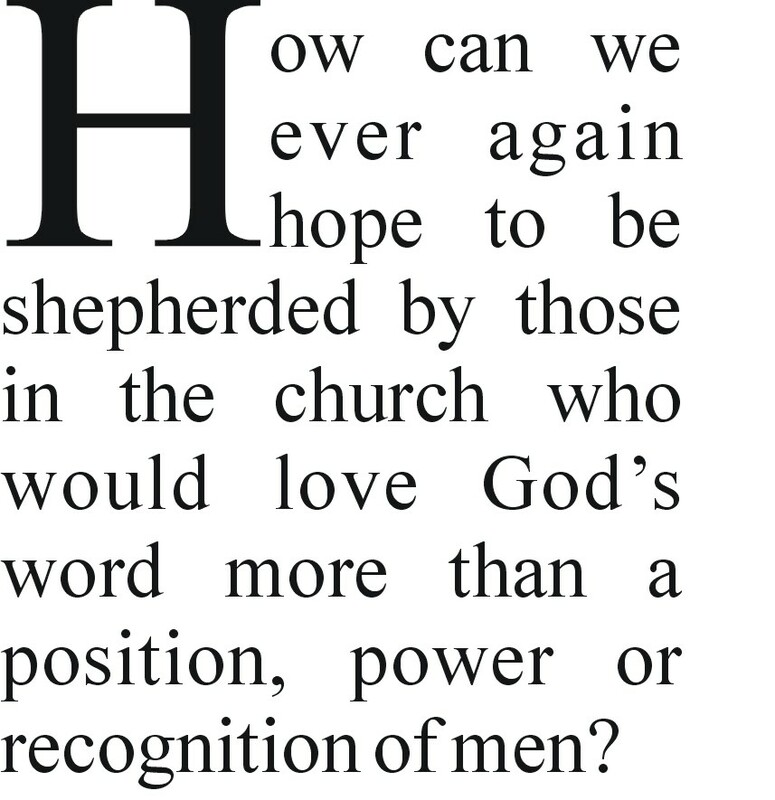 How can we ever hope to be shepherded again by those in the church who would love God’s word more than a position, power or recognition of men? As the Lord says, we need to acknowledge our guilt. We need to repent of our sins. We in our hardened hearts may say we have not worshipped anyone but our God. We may ask with whom or what idol have we committed idolatry? To whom have we scattered our favors to foreign gods? The answer is every time we sin we commit idolatry. Hasn’t Paul instructed us to put to death the idolatry which comes from our sinful nature. If we as His people will take the instructions of the Lord through the prophet and repent and turn from our sins and walk in obedience, He said He will give us shepherds after His own heart who will lead with understanding and knowledge of God’s word. But as it is something terrible is going on in the hearts of the people. The popular churches are those that preach the easy salvation and biblical principles for success. Lowly in the eyes of man is the church that preaches the gospel according to the gospel. In many of our churches today a man is not a Shepherd based on his heart after God nor his understanding and knowledge of God’s word. Many of our Shepherds are men who are accredited to us because they have a formal education and have the blessing of other men. We are taught in most of our congregations it is the formal education at some institution that recommends men to us as shepherds. We put our confidence in that single piece of paper framed and hanging on the wall in some church office as all the recommendation we need. Many of us have forsaken the word of God and the gospel of scripture for our churched gospel and His people love it this way. But what will we do in the end? If the Holy Spirit is speaking to you about the gospel according to the gospel don’t harden your hearts. Instead let us be a people who hear His voice in scripture and respond with repentance and obedience. If the Holy Spirit is speaking to us, let us not turn from the living God. Let not our stubborn refusal to repent from our sins and be obedient to the hope we have in Christ that we find in the gospel of scripture, keep us from the living God. If the Holy Spirit is speaking to us, let us repent with much sorrow for our sinful unbelieving faithlessness. We may say we have not committed idolatry, we may say we do not need to repent, but let us not be deceived instead take my encouragement to hear and obey the word of the Lord. The example has been set before us as we say we have come to Christ. We need to live our faith firmly to the end being faithful in obedience to our hope held out in the gospel, if we want to enter our rest. Did that sound familiar? They had the same gospel preached to them at Mount Sinai as we did to us. If indeed we hear the gospel of scripture. If we do not hear the gospel of scripture and be obedient to it till the end we will die in our sins. If we hear the gospel of scripture and are disobedient and faithless we will die in our sins. Let us not find ourselves excluded from our rest because of our unbelief in the gospel. Let us enter our rest since it still stands for us at it did for them. Let the message of the gospel according to the gospel take root in us and have value for our lives as we repent and combine it with faith and obedience. In popular churches today we teach and make converts by saying people can be forgiven of their sins. We do this by teaching them God loves them and wants to forgive them. We then tell them they are saved. At this point what other commitment is required but tithing and faithful attendance? We unintentionally release people to sin’s deceitfulness, a life of sin where they now become disobedient to the gospel because we told them they are saved. We don’t tell them they have a hope of salvation at the altar and they must be obedient and faithful to the end in order to be saved. It is one thing for a person to know they are lost and going to hell because they are sinners. It is another thing to teach people they are saved only to release them to a life of sin in which they are now deceived they have been saved. We all know sin runs amuck in the church. Wouldn’t it have been better if they would have never heard the modern popular gospel? At least they still might see they are sinners and need to repent because they know they are lost. Instead we tell them they are saved outside of repentance and obedience. We have a sinful disobedient people in the church thinking they are saved. We in the church have taken the lost and made them twice as lost with our church gospel. The lost now has no idea they are lost when they sit in their pews unrepentant and disobedient to the gospel and hope presented in scripture. When the gospel of scripture wants to set men free from sin and death by having men repent and becoming obedient to the gospel, to be free from the life of slavery to sin, that was promised to our father Abraham, the Law of Moses and the prophets. Why should we take warning from scripture if we can take comfort in our church gospel? We spiritual and pious can’t even take comfort in our past obedience before God. We need to remain till the end. And yes I have all confidence we will call the Lord unjust on the Day of Judgment when we stand before Him. We already know there will be many shut out of the kingdom of God only to find themselves in hell. These people will say didn’t we know you. Didn’t we prophesy or cast out demons in your name, and Jesus will say I never knew you. So let us comfort ourselves with our so called manifestations of the Spirit. Let us comfort ourselves in our weekly attendance and growing membership. Let us boast of our programs. Let us take comfort in our principles of Biblical success. It sounds like many will, yep that was the word Jesus used, will think they have a right to be with Him in His kingdom but not be able to enter. It is only those who build their lives on His teachings. I have been trying to persuade you my brothers that His teaching is the gospel in the entirety of scripture and not just starting at Matthew. I have been trying to persuade you my brothers concerning His word, as the Word of God who became flesh. This word testifies from Genesis to Revelation His gospel, so that we may together follow all His word and hope in His gospel for our salvation. Let us not forget that many will ignore this prompting, I just don’t want it to be us. Those to whom of us who do not listen to the gospel according to the gospel and live a live of sin we will be called evildoers. We will find ourselves outside under judgment. It is a narrow path and many will think they will go through that gate. 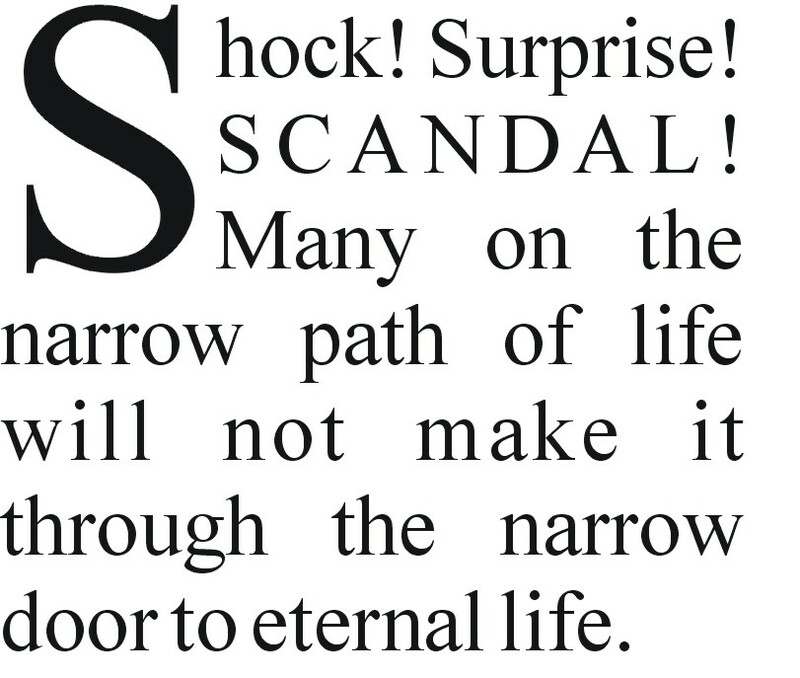 Just like the last words of Jesus I mentioned, there will be many who will not make it through the narrow door. There are many people under all kinds of teaching in the church today who assume they are going through the narrow door because they go to church or confessed some kind of belief in Christ. But listen to the warnings of Christ. Many will not make it, not because they are on the wide path that leads to destruction. They will be on the narrow path and still not make it. Many of us who claim some association with the Word of God and Christ will not make it. These are Christ’s words and warnings. This is why I have been taking the time to explain what the gospel is according to scripture so we can live according to it. Not according to some unscriptural hybrid gospel that will deceive us into thinking we are going to heaven when we are headed straight for hell. If we say we are truly on the narrow path let us make sure that we are one of the ones who actually goes through that gate. Please my brothers hear the Spirit of the Lord today. Will we say I will not listen to the word of the Lord? Will we tell the God in whom our hope of salvation comes, I will not pay attention? Will we continue to ignore the words sent by the Spirit through the prophets? Will we let our hearts be hard like flint towards the gospel in scripture? Do we want the Lord to listen to our cries for salvation on the great Day of the Lord only to have him not listen, since we would not listen to Him? Let us listen to Him today so we can base our lives on His hope presented in the gospel. Do we really want to put our hope in a churched gospel that teaches we do not need to repent and turn from a life of sin? Do we really want to put our hope in a churched gospel that says the sinful will not have to worry about not going to heaven? Do we really want to deceive ourselves with a different gospel? Will we let the Holy Spirit expose our sins so that we may be healed? Or will choose to continue to believe this churched gospel with its false hopes? What good is our gospel if it doesn’t expose our sins so we can repent and be forgiven? What good is the preaching from the pulpit if Sunday after Sunday we get success and false forgiveness and sermons on God’s love if they don’t expose our sins? Can’t we see that God wants us sinners to acknowledge we have sinned and repent and turn from our sins in His gospel? What, enough already. Time to change the subject? Tired of hearing it? Unwilling to listen anymore? No longer want to be confronted with the words of the Holy One of Israel? What does the Lord of our hope of salvation say in His word through His prophets? Will we say I will not pay attention to the Lord’s instruction to turn from my wicked ways and change? Will we still refuse to speak to the sinner from the pulpit so they may know they are lost in their sins. Will we still refuse to challenge the sinner to repent or the saint to remain faithful and holy unto the Lord. We have heard again and again from the servants of the Lord a sinful people will not inherit the Kingdom of God. Should we now be deceived by a different gospel? Let us not deceive ourselves that we need not remain steadfast to the end on order to make our hope sure. Let us not say today we have laid hold of that which Paul himself would not boast of laying hold of, even salvation. My brothers who insist on preaching forgiveness without repentance please hear the words of the Lord. We need to turn from our wickedness. We need to obey the gospel according the gospel and teach others to consider the whole council of God. For His covenant is a covenant of love. The Lord’s arm is not too short to bring us our salvation on the day of His return. 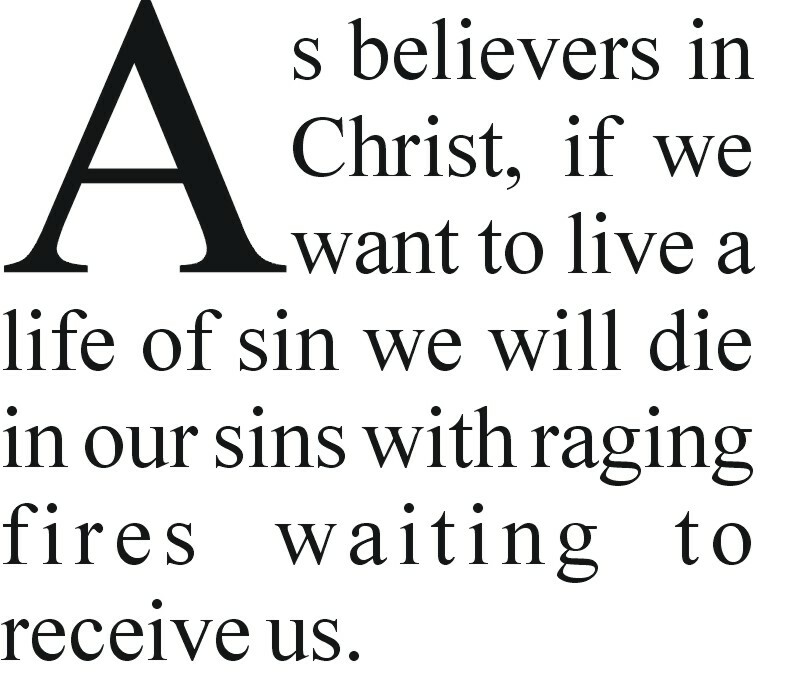 Surely we will not have hoped in vain for our crown of life if we are servants who repent and leave a life of sin. Certainly He will hear our cry to be forgiven of our sins when we cry out in repentance. No matter how highly we think of our particular pastor, church, programs, doctrine let us all know it is our sins that have hidden His face from us. It is our sin that keeps us from hearing Him as His word has declared. Let us leave the church gospel of men for the gospel according to the gospel from God so that we will not miss the salvation of the Lord. We won’t miss His salvation because His arm is too short but because we will not repent of our sins and turn from our sinful lifestyles. If I have gone too far and this is not for us, then let us comfort ourselves by saying we are saved at the alter. Let us comfort ourselves by saying we in church today only need to understand God loves us. Let us cast aside our hope of salvation and our need to abide in this hope. Let us boast over the Old Testament saints that our gospel is better than theirs. Let us ignore scripture when it says we have a hope of being saved based on the same hope they had. Let us not only mislead people of the church today they are saved when they are not, let us mislead them by convincing them they have a sure thing in their salvation and can not loose it. Let us totally cast aside all scripture and our Savior. Let us no longer be accountable to Him or His word. Do we really care what He says anyway?